Higher Nature AEterna Gold Hyaluronic Acid is nature’s moisturiser” because it binds up to 1000 times its own weight in water. 50% of the body’s Hyaluronic acid is found in the skin. Hyaluronic acid is known as "nature’s moisturiser” because it binds up to 1000 times its own weight in water. 50% of the body’s Hyaluronic acid is found in the skin. Antioxidant Vitamin C acts against age accelerating free radicals and is required for healthy skin. Vitamin C contributes to the generation of collagen, which is the primary constituent in skin. May not be suitable in cases of lymphoedema. Salt, starch, soya, wheat, gluten, yeast, lactose, dairy products, artificial preservatives, colours or flavourings. 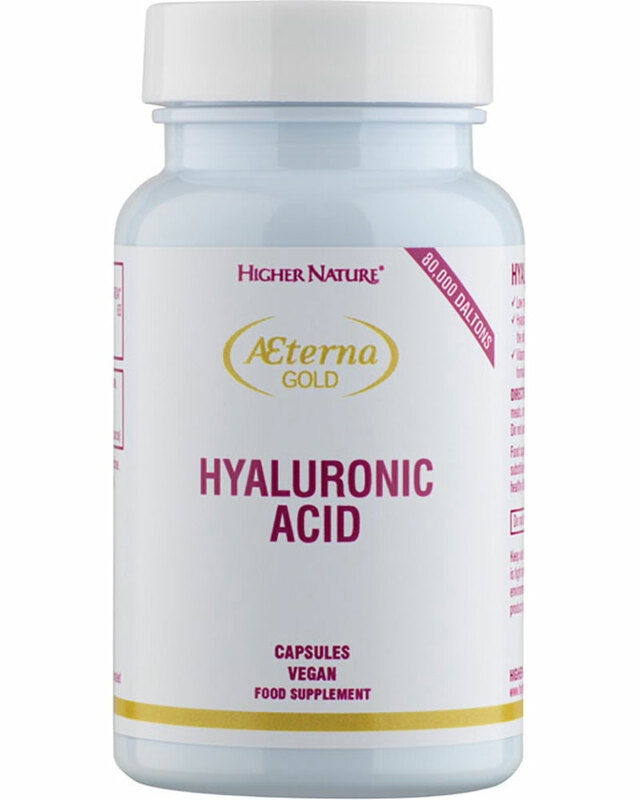 Take 1 capsule of Higher Nature Hyaluronic Acid a day, with meals.